Happy Friday! Smart brevity hits the big screen ... Debuting Monday on MSNBC: A new daily Axios “1 big thing” segment will air at 5:55 a.m. on “First Look,” in the lead-in to “Morning Joe.” Tune in for a sneak peek at my top item! With the expected ouster of National Security Adviser H.R. McMaster, President Trump's decision on a replacement could result in one of the biggest policy shifts of all of this White House's frequent comings-and-goings. Axios' Jonathan Swan reports that inside the West Wing, the most oft-mentioned potential successor is John Bolton, U.S. ambassador to the U.N. under President George W. Bush. Bolton is as hawkish as they come — author of an opinion piece in the Wall Street Journal last month with the provocative headline, "The Legal Case for Striking North Korea First." This would be an ironic outcome for Defense Secretary Mattis, who helps moderate the president's impulses. The SecDef has clashed with McMaster but would face a more forceful National Security Council under Bolton. Bolton is a peer — 69 years old, to Trump's 71. CNBC's Larry Kudlow, 70, was officially named economic adviser yesterday, succeeding Gary Cohn. Commerce Secretary Wilbur Ross, 80, beat Cohn in the tariffs battle. Bolton is a Fox News contributor, making him — like Kudlow — someone the president likes seeing on TV. Trump is considering a younger TV personality and veterans' advocated — Pete Hegseth, 37, co-host of “Fox & Friends Weekend," who's an Army veteran of Iraq and Afghanistan, and a former guard at Guantanamo Bay — to replace embattled Veterans Affairs Secretary David Shulkin. So what's next for Season 2 of The Trump Show? Trump told reporters Tuesday, after booting Secretary of State Rex Tillerson: "I’ve gotten to know a lot of people very well over the last year and I’m really at a point where we’re getting very close to having the cabinet and other things that I want." 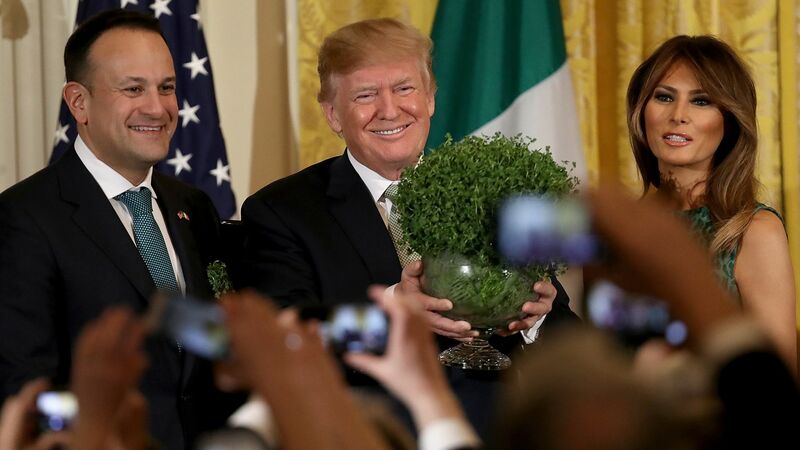 Trump added yesterday: "There will always be change, and I think you want to see change. And I want to also see different ideas." Be smart: As we've been telling you, Trump is increasingly comfortable with acting on his instincts and whims. He's taking the advice of fewer people on his staff, and is even less likely to defer to them than before. Comey has been quiet for nearly a year — fired by President Trump on May 9, precipitating the appointment of special counsel Bob Mueller eight days later. He has heard a lot of lies and misstatements about the FBI that he intends to correct. He didn’t want to be in this position, but is embracing it. There'll be more announcements about his book tour soon, but he’s eager to go to where his critics are and take them on. He has seen three presidents up close (George W. Bush, Barack Obama, Donald Trump), and will compare and contrast the first two he served to the third. As you can guess, what he says is going to rattle a lot of china. I'll interview Comey at his sole Washington appearance on the tour — on April 30 at 7 p.m. (Lisner Auditorium, 730 21st St. NW), at an event presented jointly by Politics and Prose Bookstore and Axios. Comey's blitz: See a list of Comey's three announced network TV sit-downs, and his 11 in-person appearances, from Seattle to Kansas City to Miami. Mueller "has subpoenaed the Trump Organization ... to turn over documents, including some related to Russia," per N.Y. Times. "The order is the first known instance of the special counsel demanding records directly related to President Trump’s businesses." "The Trump administration slapped Moscow with its first sanctions for meddling in the 2016 presidential campaign," per The Wall Street Journal, "punishing ... Russians already indicted by special counsel Robert Mueller." "Cyberattacks Put Russian Fingers on the Switch at Power Plants, U.S. Says," per N.Y. Times: "The Trump administration accused Russia ... of engineering a series of cyberattacks that targeted American and European nuclear power plants and water and electric systems, and could have sabotaged or shut power plants off at will." Mueller's incursion into the Trump Organization, impinging on the president's red line of family finances, is sure to get under Trump's skin, and may make him want to fire Mueller. On the other hand, by sanctioning Russians who had been indicted by Mueller, the administration was giving its seal of approval to the special counsel's findings. At least 4 dead — Miami Herald: "A pedestrian bridge under construction collapsed, ... just days after crews had dropped an elevated 950-ton span in place on a signature project that was intended to give Florida International University students [who were on spring break] a safe route across the busy roadway." "The massive span — in a sudden, catastrophic failure — crashed down across eight lanes of heavily traveled Tamiami Trail, flattening eight cars." "[T]he project was far from complete and not expected to open to student foot traffic until 2019." 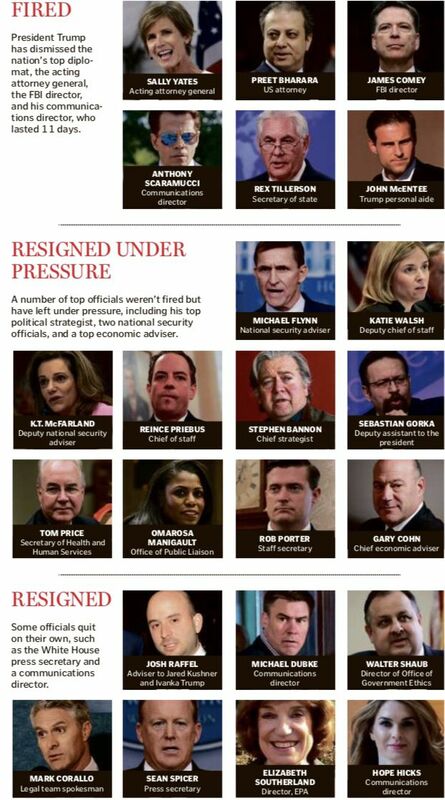 This massive scorecard, headlined "Cast keeps changing as the show goes on," dominates the front page of The Boston Globe. That straight line upward, highlighted by the U.S. Energy Information Administration yesterday, reflects one of the most dramatic turnarounds of an industry that affects so many corners of the American and global economies, from trade deficits to everyday drivers, Axios' Amy Harder writes. Key stat: Fueled by fracking and horizontal drilling, America is on track to produce a record 10.7 million barrels of oil per day this year, surpassing its 1970 record of 9.6 million, and more than double the production levels of a decade ago. "The face-off, between the Justice Department and AT&T Inc. over the company’s $85 billion agreement to buy media giant Time Warner Inc., ... could affect major pending health-care mergers and may have ramifications for the tech economy." Why it matters: "If the deal is allowed, AT&T argues, it could act as a bulwark against the power of digital media giants such as Alphabet Inc.’s Google and Facebook Inc. Or it could create an entertainment behemoth that holds consumers hostage, as the government insists." The bottom line: "The outcome could also affect how strongly the Trump administration, with its rival populist and pro-business factions, pursues the kind of vigorous antitrust enforcement that was a hallmark of the Obama administration." "An investigation is under way that is expected to conclude that China’s theft of intellectual property has cost American companies around $1trn; stinging tariffs may follow." 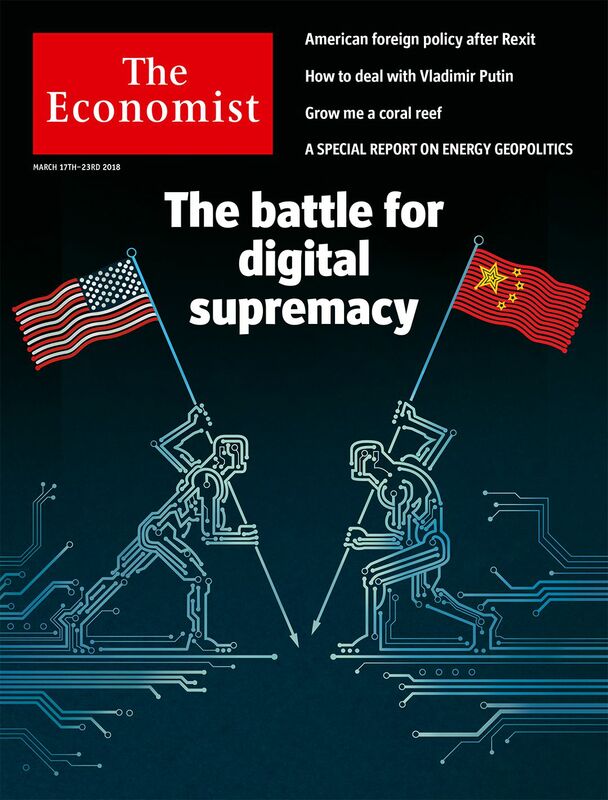 "This week President Donald Trump abruptly blocked a $142bn hostile takeover of Qualcomm, an American chipmaker, by Broadcom, a Singapore-domiciled rival, citing national-security fears over Chinese leadership in 5G." Why it matters: "Trump’s approach is defined only by what he can do to stifle China, not by what he can do to improve America’s prospects." 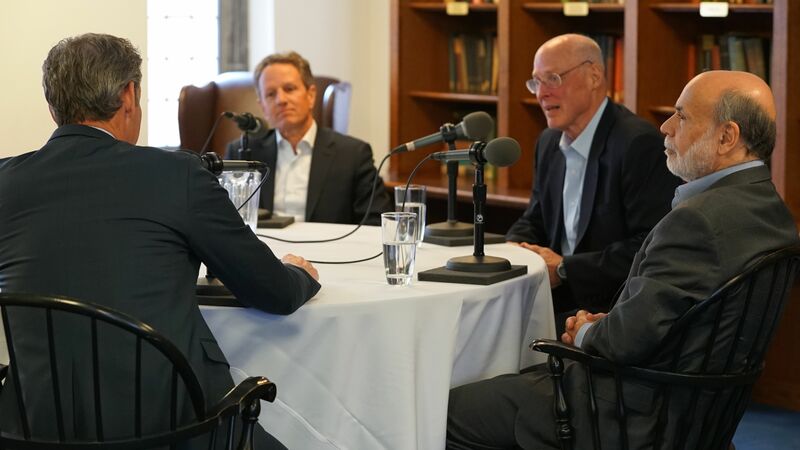 At the 10-year anniversary of the Bear Stearns collapse, Marketplaces' Kai Ryssdal (back to camera) sat down sat down with three pivotal players from the crisis: Tim Geithner, then president of the New York Fed, and later Treasury Secretary (left); then-Treasury Secretary Hank Paulson, and then-Federal Reserve Chair Ben Bernanke (right). This is the first time these three have come together to talk about what happened. Marketplace will begin airing their interviews Monday. Sneak peek ... Geithner: "[W]ith ... the financial crisis behind us, and a set of reforms that should make the system safer over time, we're back to confronting the damage caused by a deeply powerful set of long forces that were eroding the quality of life for the average American ... no income growth, huge rising inequality, deep anxiety about the future." "Blue Apron has been losing customers amid increased competition and distribution problems. The company reported 750,000 subscribers last month, down from a peak of over 1 million last year." "Independent surveys have shown that some consumers are turned off by the expense and commitment of meal-kit subscriptions. Blue Apron Chief Executive Brad Dickerson said he believes the company can find more customers for both that model and à-la-carte meals sold in stores and through its website." State of play: "Walmart Inc. and Kroger Co. also are selling their own branded meal kits, while Amazon.com Inc. offers on-demand boxes online. Other big food companies are introducing prepackaged fresh foods to tap the fastest-growing segment of grocery-store sales." Thanks for reading. See you on Axios.com!